However, the plane’s development is not complete just yet. The U.S. Marine Corps plans to purchase 420 F-35 aircraft, including 340 F-35B and 80 F-35C models, the plane’s carrier variant. The F-35B variant is capable of vertical or short takeoffs and vertical landings without requiring a catapult launcher, thanks to a lift fan and a directed thruster. 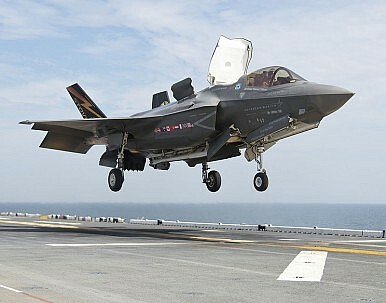 The uber-complex F-35B, with its unique capability to takeoff and land in short distances, while retaining a decent majority of the conventional F-35A’s range and payload, is really a fantastic capability that makes this particular model of the Joint Strike Fighter the most strategically relevant out of the three variants. [S]ome would say that the F-35 was built as a STOVL [short takeoff and vertical landing] aircraft first, and then adapted to a standard and carrier fighter second, instead of the other way around.